A man has walked over 700 in-game kilometers over the span of three years, in an attempt to reach Minecraft's "Far Lands". 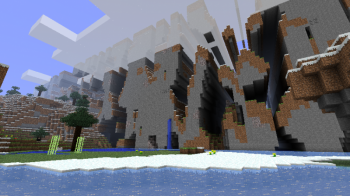 Diehard Minecraft fans will remember a place known only as the "Far Lands" - the realm on the edge of every Minecraft world where the game's procedural generation code begins to fold in on itself. Before the "feature" was patched out, players could cheat by using teleport commands to reach them, but one dedicated fan running an older version of the game has been walking for over three years in an attempt to reach the Far Lands legitimately. Kurt J. Mac started his quest in March, 2011, and has been marching toward's the end of the world (of Minecraft) ever since. He has trekked more than 700 virtual kilometers in 180 hours, but is still a long, long way off the 20,000 kilometer threshold of the Far Lands. At his current pace, it will take him another 22 years to reach his goal. But still, he walks. Mac has filmed his entire journey, and has uploaded it to YouTube for all to see, and dispel any doubts about his pilgrimage's legitimacy. "If anyone had doubts as to whether or not I was making this trek to the Far Lands without cheating, they could go back and watch all of the footage," he told the New Yorker in an interview. To stave off boredom (and to make the YouTube videos a bit more interesting), Mac fills the time with commentary on... well, pretty much everything. "The series transformed into a sort of podcast, where the topics I talk about might have little to do with the journey itself," he said. "Of course, it is always exciting when Minecraft re-grabs my attention with a perilous cliff, a zombie attack, or a memorable landscape, and I remember the journey I'm on." In a world where satellites, Google cars, and Mars rovers have mapped out pretty much everything, Mac's journey re-ignites that adventuring spirit that spurred on the great explorers of the old-world. Be sure to check out his YouTube channel and join him on his quest.